When considering high-rigor academic options like Advanced Placement (AP) classes for your homeschool, it’s almost unavoidable these days to leave university or community college dual-enrollment (DE) out of the discussion. Parents and students alike wonder about the pros and cons of choosing DE over AP. Many parents also wonder if their students should be doing both. Do colleges prefer one over the other? Should you take an AP class instead of a DE class if you are targeting a more selective college? Are there any alternatives to APs and DEs for the student who yearns for rigor and depth of learning but doesn’t want everything to be an exam? Let’s consider these options closely. in most cases, introductory college-level classes. often rigorous for students who need more challenge but don’t want to be in an actual college setting. usually taken online or self-studied. In some cases, parents organize small-group classes with a mentor (especially helpful for science APs that require lab work and foreign language APs for speaking/listening practice). Some parents apply for College Board syllabus approval. Read Jill’s Yes, Homeschoolers Can Teach APs at Home! post for pointers. expensive when taught outside the home! Online AP classes can cost from $500 to $1,000 when the cost of lab kits and books are factored in. Small group classes can be cheaper if you divide the cost of engaging a mentor among 5-6 students. relatively standardized because they cannot be called AP without College Board approval. capped with a once-a-year, standardized AP exam at the end of the school year (every May). a pain if your local school will not proctor the exam for homeschoolers (always check with your local schools before paying lots of money for an online class…and even if a school agrees to proctor AP exams for outsiders, they might not proctor a particular AP exam or might not have the resources to proctor the exam for students with learning disabilities/test accommodations). Although they are generally considered college-level, there is still a high level of variation among different APs. High scores in AP Calculus BC, AP English Literature and Composition, AP Chemistry, and AP Biology for example, might help you knock out some general education credits at your destination college or at least skip the most introductory level classes. You can look up a college’s AP credit policy here. High scores in AP Computer Science Principles or AP Human Geography however, can help your transcript to stand out but might not be accepted as a general education equivalent at some colleges. One of the questions we get asked at Simplify is whether colleges will frown upon students who self study for the AP exam without taking an actual class that was either taught online or in the home. Our experience is that in the end, the AP score speaks volumes and self-studying is rarely an issue if a student is able to score well on the exam. If the student has not taken an actual College Board approved class when self studying, we recommend that you list the class on the transcript as _______ with AP (e.g. Biology with AP or some use Advanced Biology with AP). If the syllabus was College Board approved, the class may be listed as AP _______ (e.g. AP Biology). considered college-level unless the class is at high school level, e.g. consider waiting until a student is ready for pre-calculus and above instead of dual enrolling in college algebra or geometry as these high school level classes are often considered remedial college classes. 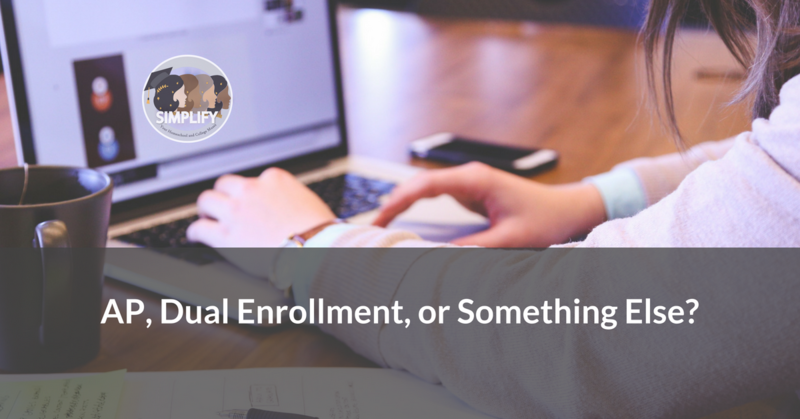 usually taken on-campus at the college or online with other college students (sometimes, DE classes are held at high schools but this is often not an option for homeschoolers). When you have a good professor (check Rate My Professor for reviews), the in-person experience with a passionate instructor is often priceless. Added bonus…college profs are often a good source for letters of recommendation! no holds barred…this is an actual college class and some classes will feature mature content…there’s no protecting your homeschooler when they are in college so be sure they are ready for it. anywhere from free to very expensive ($0 to several hundred dollars per credit hour, we kid you not) depending on your state. not standardized because different universities and community colleges in different states will have designed their curriculum differently but within a state, there might be a way to track articulation agreements with the state’s public university system. For example, California community colleges use assist.org as a repository to show how credits earned at one university or college apply when transferred to another. This is helpful for homeschoolers too to determine how their credits will transfer in-state even when the student applies to 4-year colleges as a freshman. capped with a once-a-quarter or once-a-semester final exam. Unlike APs that take a year to complete, DE classes are done in half or a third of the time, saving students a lot of time and will still count as a full high school year for transcript purposes (if unsure, check with your local school district for their policy on this). a straightforward process…most community colleges will allow high schoolers to dual enroll, possibly limiting the number of units they can take but not turning them away altogether. However, high school students are always given last priority and may not be able to get a seat in impacted classes (for example, lab science classes are often immediately full in California). Some universities allow DE too. Check their website for more information or ask to speak to their admissions office. Are DE classes more impressive than APs? That really depends. Some colleges will prefer the standardized nature of APs to the more subjective nature of how the community college or university measures up to expectations. Other colleges will be duly impressed by a high school student who has the gumption to sit in a class with college-aged students with actual college-level material, homework, and exams. The time management component of DE classes can be especially challenging and when a high school aged student succeeds in that environment, it speaks very strongly to their ability to excel wherever it is that they apply to. Like AP exams, there is no guarantee that DE credits will be accepted at the 4-year school you will attend (unless there are guaranteed agreements with an in-state public school). It is a good idea to save all books and assignments from the DE experience. Your student might be able to present the materials to their destination school to see which credits might be accepted. Do expect this process to take some time. AP and DE classes both demonstrate intellectual rigor and vitality. Both allow students to challenge themselves and show colleges that a student is willing to take risks and push themselves beyond the standard high school curriculum. But they are not the only choices available to enterprising students. a slew of MOOC classes such as Coursera, EdX, MIT Opencourseware and so on in areas of interest that the student self studies or engages in with the help of an outside mentor or tutor. engaging in high level academic research with collaboration on forums like StackExchange and Quora, demonstrating intellectual curiosity via asking and answering questions with authority and humility. creating their own research project and publishing a paper in an academic or other publication. While the alternative route may not seem “safe” or “predictable” for parents who worry about validation, it is nevertheless, a fabulous way to showcase a student’s focus and willingness to work hard in something they love and believe in . Your muses at Simplify feel that homeschoolers should not limit themselves to just APs and DEs for academic rigor. The “something else” route is also a great choice if you don’t live close to community colleges or universities or if you really cannot afford to pay for online AP classes and your student yearns for more than just standardized book learning. Have something to add to this conversation? Please start the ball rolling on our Facebook Group, College Confident Homeschoolers (CoCoH). And don’t forget to tune in to our AP Classes for Homeschoolers podcast.